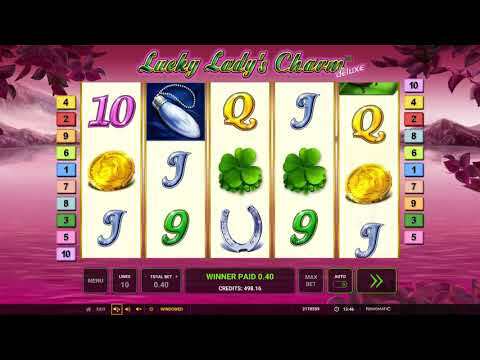 Online slot Lucky Lady´s Charm Deluxe was created by Novomatic software developer Greentube and uses Lucky Objects as its symbols. There are 5 reels, that each have 3 symbols on them and 10 paylines. It has 11 regular symbols, a Wild and a Scatter symbol, a double or nothing gamble round and free games. When 3 or more Scatter symbols appear on the reels in any order, the round of 15 free games is launched. During the Free Games, the same bet and line settings that were in place before the free games round was triggered will be used and all payouts for winning combinations will be multiplied x3. If three more scatter symbols land, you will win additional Free Games. When identical symbols appear on neighbouring reels, starting with the leftmost reel, along an active payline, they will create a winning combination. This slot has lucky themed symbols, A ladybird, a rabbit´s foot, a coin, a four leafed clover and a horseshoe, there are also playing cards A, K, Q, J, 10 and 9 and the payouts in the paytable are based on the bet amount per line and change according to your line and bet settings. The Fortune Teller´s Crystal ball is the Scatter symbol. It can create its own combos where the payouts apply to the total bet and trigger a round of free spins. The Wild symbol is the Lucky Lady. It has its own combinations and the payouts are listed in the paytable. Except for the Scatter, it can be used as a substitute for all other symbols and doubles their payouts. If you have felt the thrill of the free play version of the Lucky Lady´s Charm Deluxe online slot, imagine just how much more exciting it can get when playing for real money. After a winning spin you have a choice whether to collect your winnings or try to increase them by playing the double or nothing gamble game. If you click on the gamble button a new screen will open that shows a face down playing card. Eitherside you will see Red and Black buttons that you need to click on to choose which colour you think the card is. You will also be able to see the amount that you are gambling, your potential winnings and the previous cards that were revealed. If your guess is correct you can use your winnings to play again, or return to the main game. However, if your guess was not correct, all your winnings will be lost. As this game was originally designed for players with PC´s or laptops a larger control panel was used, however, with advances in technology and the increase in the number of players who prefer to use their mobile phone or tablet to play games online, this Gaminator slot by Greentube was updated so there are less menu buttons to make it easier for players with a smaller screen to control. Regardless of which version of the game you are playing you will still be able to see the same information, including your balance and winnings, and be able to determine the bet and line settings. You can also start a round of autospins, view the paytable and rules, start automatic reel spins, control the game sounds, activate full screen mode and see the current time. As Greentube (Novomatic´s interactive division) is committed to responsible gaming, you make see a reality check pop up. It will show you how long you have been playing, the amount you have bet and winnings that you have received. Once you have read the information you are given the option to continue playing or close the game. Having mastered the free to play demo of the Lucky Lady´s Charm Deluxe slot, you may wish to play other Novomatic games, such as Queen of Hearts Deluxe.